You’ve probably read or heard that to create a QR Code, you need a QR Code generator. But, what really is a QR Code generator? A QR Code generator is an online software that allows users to create and download QR Code images in different formats—PNG, JPG, SVG, etc. Once you’ve created your QR Code, you can download the image in the format that best suits your needs and print or share it on a medium of your choice where others can scan it. 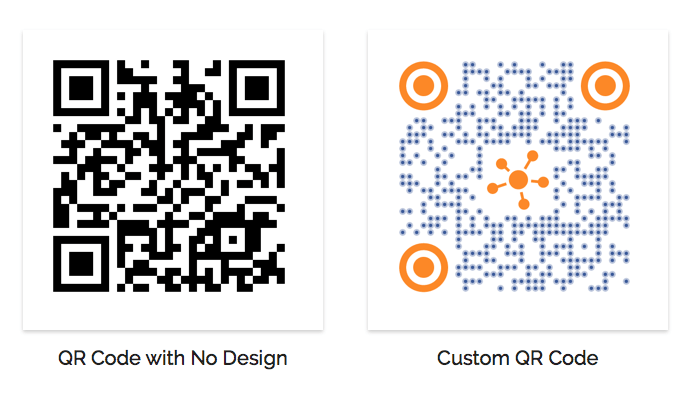 There are two types of QR Code generators available online—Basic and Advanced. Basic QR Code generators allow users to create Static QR Codes, which is simply content (text, URL, etc.) encoded into the QR Code (just like a barcode). When this QR Code is scanned, it will always show this content. Basic QR Code generators have limited functionality and are usually freely available. Advanced QR Code generators allow users to create Dynamic QR Codes. These QR Codes allow users to edit the QR Code’s content (image, text, URL, etc.) at any time. For example, with a Dynamic QR Code, you can share a link to your Facebook page first and then change it to your Twitter profile’s link at any time. Read more about Dynamic QR Codes. The tracking feature allows users to track scan activity by date, time, geography, device (smartphone, tablet) , and operating system (iOS, Android, Windows). 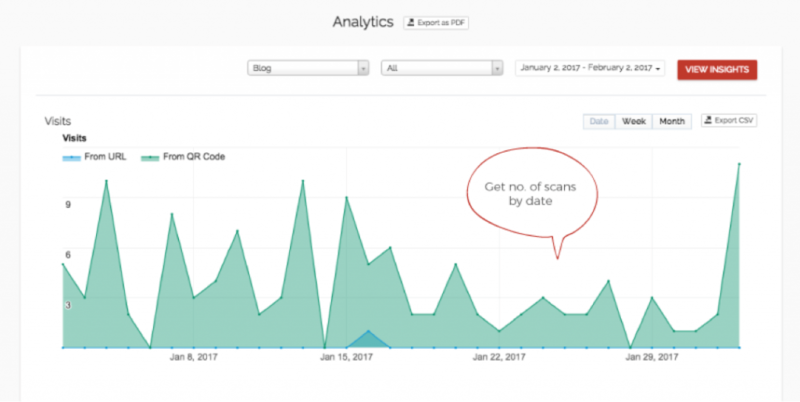 These tracking analytics help marketers measure engagement of their marketing campaigns. The tracking analytics feature is only possible with Dynamic QR Codes. With this feature, users can personalize their QR Codes by adding colors, logo, and image in their QR Codes. Colorful QR Codes are more visually-appealing than the plain black-and-white ones. This feature is helpful for marketers who do not own a website but wish to share promotional content such as more information about a product, offers pages, or ads. Some advanced QR Code generators allow users to create mobile optimized web pages, called landing pages. On scanning a QR Code, the audience is directed to a landing page where users can share content of their choice (text, images, videos, etc.). Now that we know what a QR Code generator is and its types, the next step is to learn how to use a QR Code generator. This step depends on the type of QR Code you wish to create. Let’s assume you want to create a QR Code that allows you to share a PDF file. For this example, I’m using the Scanova QR Code generator. To learn how to add advanced features to your QR Code, read: How to use a QR Code Generator. The next step is to choose a QR Code generator. A simple Google search will show a long list of online QR Code generators. But how do you know which one suits your requirements the best? 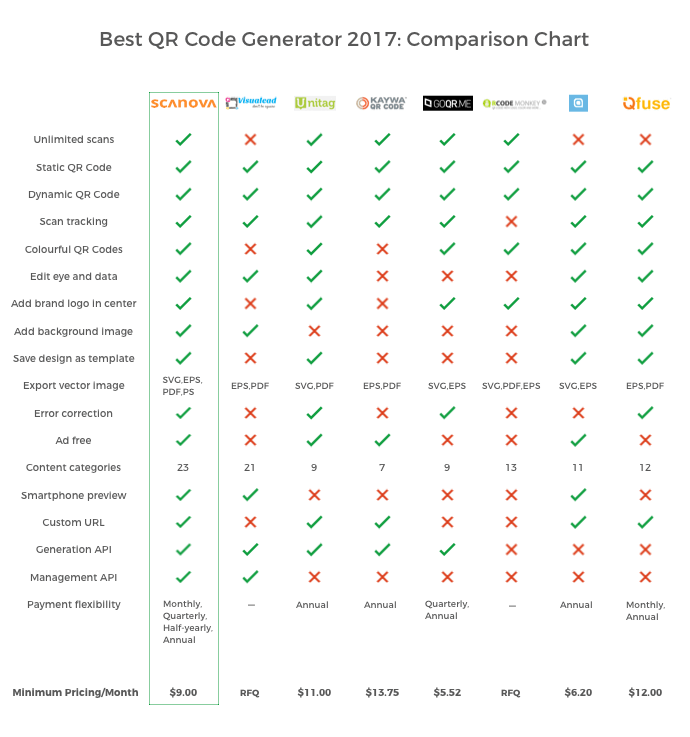 Here is a detailed comparison chart of the most popular QR Code generators online to help you choose better. Congratulations! You now know everything there is to know about QR Code generators that can help you create the perfect QR Code. 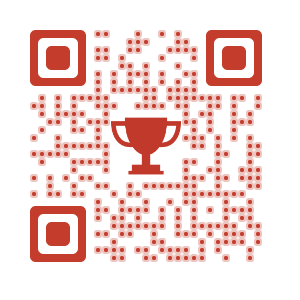 Go ahead and create your first QR Code with Scanova.